Room entirely renovated and air-conditioned with bed 160 in a beautiful villa among the olive trees several centuries of the Lubéron, dominant panoramic view with large heated pool 10x5m (shared with the co-owner who provides maintenance, will welcome you and ensure your comfort). Rates according to season. 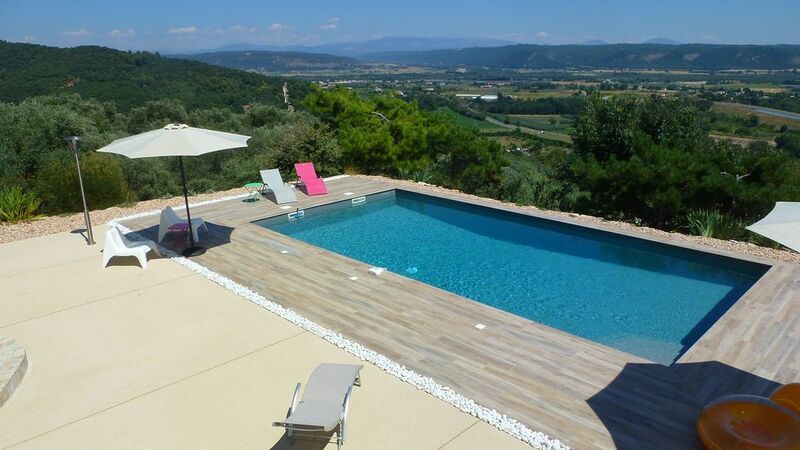 At the foot of climbing cliffs (more than 100 routes of difficulty up to 8c), surrounded by nature and quiet on the heights of the typical Provencal village of Volx, 5 minutes walk from its busy shopping streets. At the east entrance of the Luberon Park, between Manosque (7 km) and Forcalquier (15 km), 45 minutes from Aix-en-Provence by motorway, from Aix / Marseille Marignane airport, or from the train station TGV. The sea and the creeks of Cassis are 75 minutes drive. Several well-developed water bodies within 15 minutes drive. Bathroom composed of a shower cabin, a vanity unit, a towel dryer, a toilet, all new. Access to barbecue and plancha with financial participation, included fuels, maintenance, loan of dishes and cleaning. The breakfasts are served in your room, adaptation possible according to your tastes (omelette, ham, cheese, smoked salmon etc.) Meals are to be defined the day before. Parfait avec un grand P !! Accueil chaleureux, le propriétaire est vraiment attentif aux besoins de ces hôtes, petit déjeuner copieux, chambre et sanitaire très propre, literie confortable, environnement magnifique ainsi que la piscine. Nous c'est sûr on reviendra ! Less than an hour: the gorges du Verdon and 35 minutes the Valensole plateau with its lavender fields.